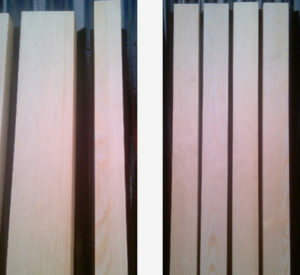 Longman gates has researched the ever increasing laminated Redwood Softwood Pine market and a decision has been made to offer this in two grades, Joinery stock which is laminated on the edge so gives the appearance of one section of timber from the front and rear, ideal for painting or staining and paint grade stock which is laminated on the edge and face. This isn’t a new product; it has been used in the mass production of doors and windows for a number of years and is becoming more recognised with the small joinery manufacturer. These products benefit from being environmentally friend and give greater stability to the end product. The glue used in the laminating process is a D4 exterior glue, which is water resistant. This stock is guaranteed not to de-laminate although just like other softwoods being used externally, it will need to be treated. We recommend finishing our softwood, or laminated softwood garage doors and gates, with at least 2 coats of Cuprinol clear wood preservative. Then either using Sadolin or Sikkens woodstain for joinery stock or Sadolin or Sikkens paint system, for paint grade stock, all as per the manufactures instructions, for a film forming water repellent finish. These products should be used before or straight after installation. Please make sure end grain and all parts of the doors or gates are thoroughly treated. 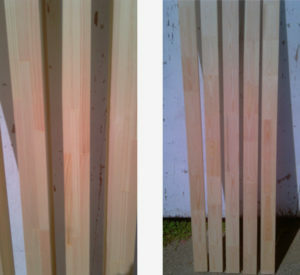 Please view the photo’s below to see the difference between the two types of stock which we are available.